I think one of the most fun things about Halloween besides the costumes, is that it’s focused on night time. 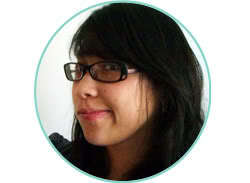 I am a night owl at heart so it’s fun when other people are staying up late too. And what better way to celebrate the dark night than with black lights and glow in the dark stuff. I’ve gushed before about my love for tulip fabric paint but I finally tried out Tulip Glow Paints and guys they are really awesome! 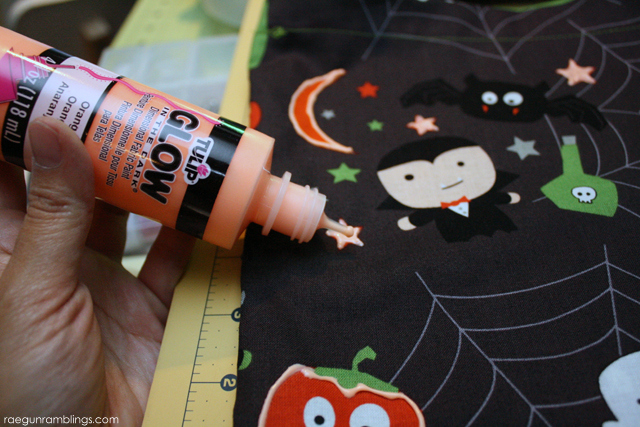 I don’t know about you but I’m always wary about glow-in-the-dark craft stuff since it’s kind of hit or miss but this stuff works really well. 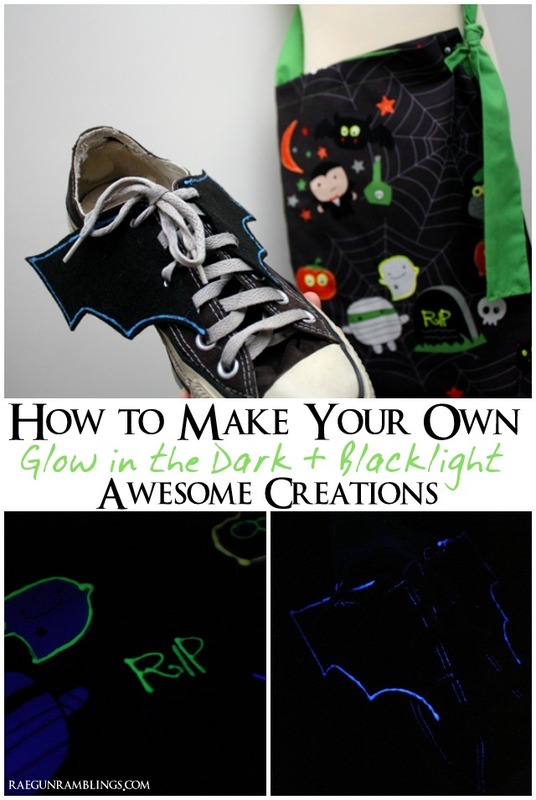 So well that I have not one but TWO fun glow-in-the-dark tutorials for you today. Cut your bat wings out. Top with a line of Tulip glow paint and allow to dry. Tread onto your shoe, find a dark room, dance and marvel at your awesome shoe accessories! Fold your main fabric right sides together and sew one short side and one long side. Fold the raw edge under 2 inches and iron. Fold the ends of your small piece under and pin to one side of your bag (this is your strap loop). Sew down. 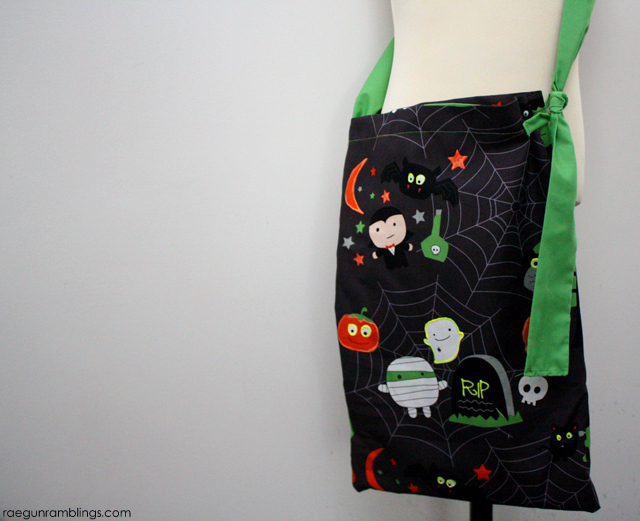 Pin the unsewn edge of the strap to the inside of your bag and sew around hemming the top of your bag while tacking down the strap. Take your small piece and fold in halve and sew the long edge. Turn right side out and iron. Fold your strap in half lengthwise and sew one short edge and the long edge. Thread your strap through the loop and tie. 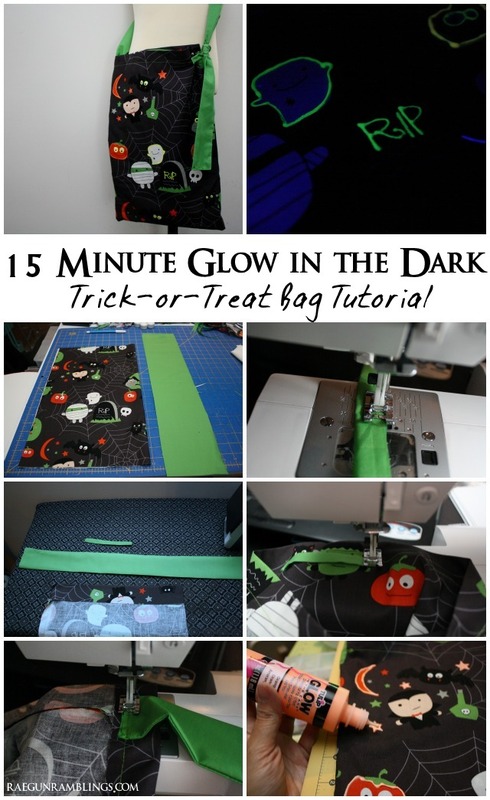 Use Tulip glow paint to accent your bag and allow to dry fully. Before you head out to your party or trick or treating make sure to activate your paint by holding it under a black light or UV light. This makes it glow even better. It’s really fun to see it work. I was so impressed by both the regular glow in the dark paint and the black light paint they definitely do what they are supposed to well! 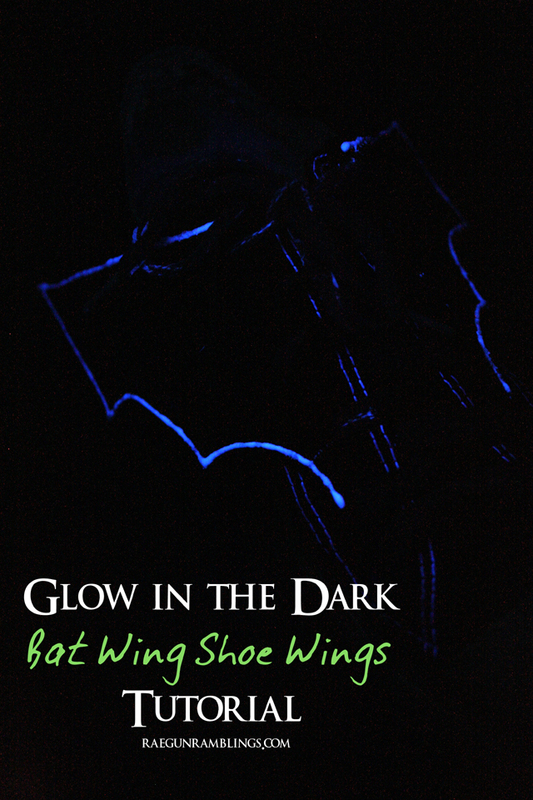 I think it would be so fun to give a basic bag to little ones and let them go crazy with the Tulip glow paint. As long as you make sure to activate the paint you’re sure to have nice glowing kiddos while they make the rounds gathering up candy :) See more from Tulip by visiting them on Facebook, Twitter, and Pinterest. 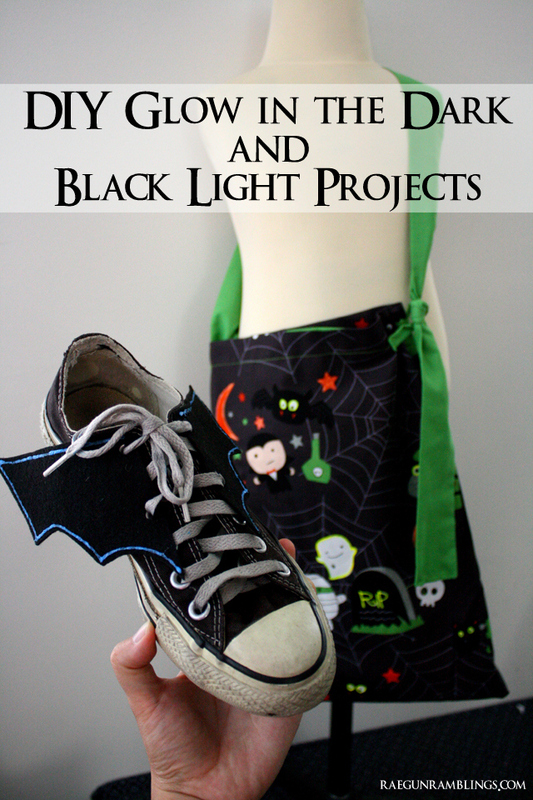 Check out other awesome glow projects from my blogger friends! Oh my gosh, these ideas are so cute. I love the bat wings!!!! 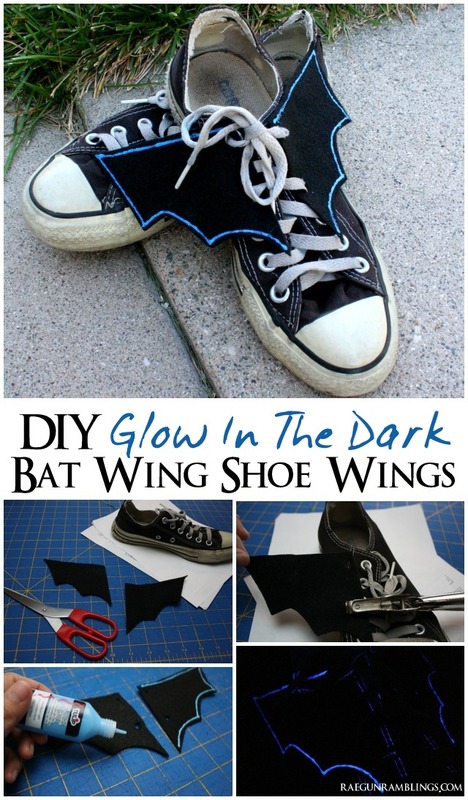 The batwings are so cool! I bet your kids love them!